Campbell’s Soup, Marilyn Monroe, Coca-Cola and words like ‘whaam’. Pop art emerged in the post-World War II period during which the US underwent unprecedented economic growth, paving the way to the rise of consumerism. Alongside this was the rise of pop culture icons such as Marilyn Monroe and Elvis Presley. As the TV replaced the radio, American life became overwhelmed with imagery of pop culture and mass advertising. Cue the soup cans and Marilyn Monroe’s windswept dress. Pop art was a movement in Britain and the US primarily in the 1950s and 60s which took imagery (and even techniques like silkscreening) from popular and commercial culture in America. If the soup cans and Elvis aren’t enough of an indication, you can spot a Pop artwork pretty easily as they are bright and bold in colour. 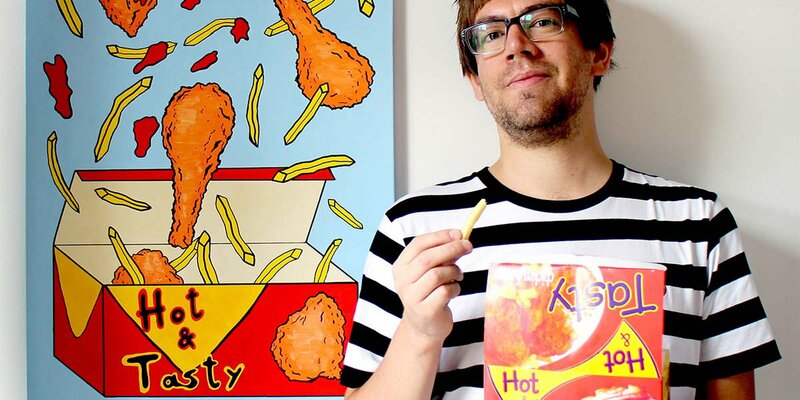 Contrary to popular belief, Pop art actually was founded in Britain, not the US. Gasp! The movement traces its history back to 1947 and Eduardo Paolozzi’s ‘I was a Rich Man’s Plaything’, which included imagery such as a Coca-Cola can and even the term ‘Pop’. Paolozzi was part of the Independent Group (IG), which included artists like Richard Hamilton. You may know him as the designer for the Beatles' 'White Album', or from our article on digital art. The IG shared opposing feelings for the elitist art world as it was and discussed ways to explore art that the masses could relate to. These talks culminated in a show at London’s Institute of Contemporary Arts, where Hamilton exhibited his collage ‘Just What Is It that Makes Today's Home So Different and So Appealing?’, which became iconic for the movement coined ‘Pop art’. But while easily recognisable, artists such as Andy Warhol and Roy Lichtenstein exhibited their own, unique style. Andy Warhol, the Pop art icon who hardly needs an introduction, worked as a commercial illustrator before exploring a career as an artist. He was therefore familiar with the mass production of imagery, something that he brought to his art as he employed assistants to help him increase productivity. In fact, a number of Warhol’s artwork are produced in multiples, such as his recognisable 'Marilyn Diptych’. Multiples of the same image on a single canvas highlighted the industrial nature of his work and still inspires contemporary artists today. Warhol himself even said that everyone will be famous for 15 minutes. I thinks it’s fair to say Warhol accomplished that, and then some. If you’re a fan of comic books, Roy Lichtenstein is your man. Lichtenstein’s work is characterised by the use of the Benday dot system which is used in comics and newspapers. Utilising almost exclusively primary colours, Lichtenstein incorporated imagery from popular culture and everyday life into his works. Much of Lichtenstein’s work focused on satire and parody, most commonly seen in his later works which parodied those of great painters such as Claude Monet in Lichtenstein’s ‘Haystacks #1’. Lichtenstein was fascinated by the way a technique - such as that which is used to create comics - can be used to express emotional subject matter, (for example, the recent World War and the political anxieties of the period). Thus, one of his most famous works of one plane shooting down another, ‘Whaam!’, was born. It’s not just an excerpt from a comic strip now, is it? Pop art didn’t stop with Warhol and Lichtenstein,but continues to influence the art world today. The Neo-pop movement boasts of contemporary art superstars from Jeff Koons, the infamous creator of the shiny and colourful balloon animals, to Takashi Murakami, a Japanese artist working in anime and manga cartoon styles. The artworks by these artists continue the themes of their predecessors: they’re bold, they stand out and their imagery is instantly recognisable. As a result, the public gravitates to them which is something anyone who has battled a crowd to snap a picture of a Koons artwork can attest to. In essence, they’re artwork for the masses. Sound familiar?